Marshall BioResources is the exclusive supplier of Göttingen Minipigs® in North America. The Göttingen Minipig was developed at the University of Göttingen, Germany, and resulted from a crossing between the Minnesota minipig, the Vietnamese potbelly pig, and the German Landrace. 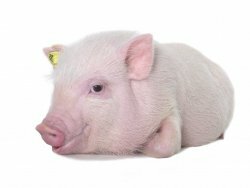 Pigs and humans share many physiological similarities, and the Göttingen Minipig has contributed significantly to our understanding of disease and to the development of new therapies and medicines. Please contact us for pricing or for more information about availability of Göttingen Minipigs® in your region. Login to our site under Customer Access to access our background data. For Göttingen Minipigs® outside of North America, please contact Ellegaard Göttingen Minipigs A/S.